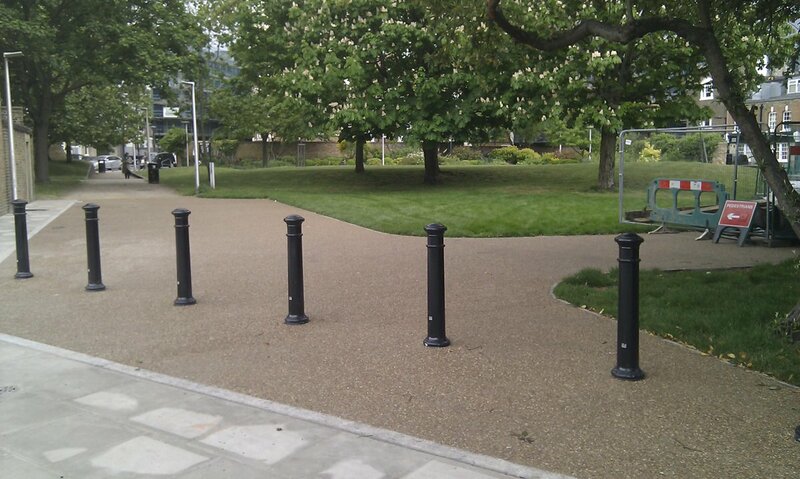 Southwark’s Parks Department has recently completed what turns out to be “phase one” of the works to impro ve Mint St Park. Trouble is, the local residents don’t see it as an improvement! Plans to increase the size of the park by incorporating and greening two dead end roads have backfired – instead creating a continuous path through the park that encourages cyclists and motorcyclists to ride through the park when they did not do so before. In addition, the removal of a wall alongside the busy Southwark Bridge Rd has created a potential hazard for children and dogs, who can now run straight out onto the road. Last night I attended a meeting with a large group of residents who live in the area immediately surrounding Mint St Park, who are not happy with the recent works that have been carried out by the Council. There is an overriding concern that what has been delivered is not what was approved by the planning department in May 2014 and, more importantly, that the changes have been made without further consultation with local residents. Mint Street Park has had a steering group of local residents and stakeholders for at least the last 10 years, and the wider community have been actively involved in numerous public consultations during that time. The removal of the wall at the Southwark Bridge Road end of the site and the insertion of a number of ugly black bollards has created a danger for children and dogs, who can now run freely out of the park and into a busy main road. It also means that footballs go straight out on to the road. This area needs to have some kind of barrier (preferably a green one) installed as a matter of urgency. The gritting on the paths has not been finished properly, leaving the paths slippery. In addition, some areas have not been fully finished off. (anecdotally, this has been corroborated by the workmen themselves) In addition, there is an area between the playground and the football pitch that has not been upgraded at all. The design of the new path between Mint St and Southwark Bridge Rd has effectively created a new “road” through the park that is now used by motor bikes and cyclists, making the park less safe for park users than it was before. In addition, more vehicles are using the area to park – which is not helped by the fact that the bollards at the Mint St end are not being locked. When were the post-planning changes to the design made, and why was the community not told about these changes? Why has the loading bay on Southwark Bridge Rd, which was in the original design, not been included? When did the “1003mm high freestanding wall with entrance signage” and “plant bed with reclaimed kerb edging” on Southwark Bridge Rd get replaced by a row of ugly bollards? There was not supposed to be any vehicular access from this end of the park, so why bollards. Why has the quantity of planting beds been reduced on more recent plans that we have now seen copies of? Why has money been wasted on expensive surfacing of the paths where plant beds were proposed? Are there, in fact, not going to be any plant beds now? The most important element of the whole redesign from the community’s point of view was to incorporate the hammerheads into the park to create more green space and less hard surface. Why, therefore, does the park appear to have more hard surface now? The benches have been moved and have now been set too low for adults to sit on comfortably. Please can they be reinstalled at the correct height? And please can there be more benches, as there is plenty of space for them. There are not enough bins, and they need to be emptied more often. Please can they be emptied in the afternoons so that the rat problem in the park is not exacerbated by bins that are overflowing overnight? There is a concern that the paths have not been designed for optimum drainage, and that this will impact on the rest of the park. There is a concern that the paths are now being used by vehicles but that the surface is not suitable for heavy vehicle use. There is a request for cctv to monitor people who are not picking up their dog mess, and also to deter the street drinkers who have taken over the stage area during the daytime. It was noted that there has been an increase in people sleeping in the park, and a request that there is better co-ordination between parks/St Mungo’s/wardens and safer neighbourhood police. I would like to arrange a walkabout with you in the next couple of weeks so that we can show you exactly where these issues are and how they impact on the park. I look forward to your speedy response – particularly to the safety issues, and to set a date for the walkabout. I will publish their response in my next blog.